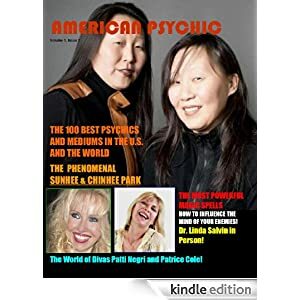 AMERICAN PSYCHIC MAGAZINE is the first international magazine on psychics, mediums, metaphysicians, lightworkers and their esoteric world and practices. Exquisite in its design, elegant and stunning in its layout, and authoritative in its contents. • America and the world’s 100 best psychics, mediums & lightworkers. • The afterlife during the 40 day period following death. • How much do you know about Sunhee Park, Chinhee Park, Patti Negri and Patrice Cole, the divas of the occult? The Glamorous and the down-to-earth superstars lightworkers. • Dr. Linda Salvin, lightworker of the month. • Ascended Masters technique/lesson to boost your body’s energy and mind’s power.